Revisiting a post featuring a panorama inside a Red Telephone Box we now have a outside view of the location in Byng Place. Registered as Grade II listed buildings the phoneboxes are set against the backdrop of the Church of Christ the King in Bloomsbury. The Red Phonebox is a classic design by Sir Giles Gilbert Scott who amoungest other notable buildings also designed Battersea Power Station. The K6 “Jubilee” model pictured here was built to commemorate the Silver Jubilee of King George V in 1935. 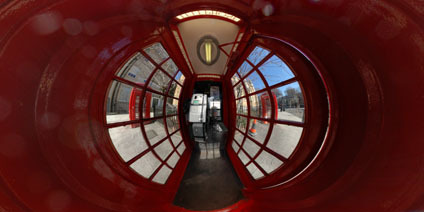 View the Quicktime panorama of Inside the Red Phonebox in London (3.2mb). 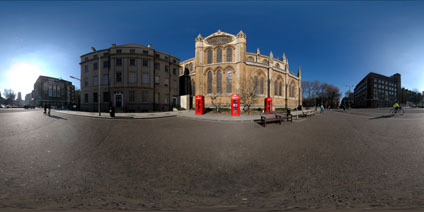 View the Quicktime panorama of Outside the Phonebox and the Church of Christ the King in Bloomsbury (2.7mb). 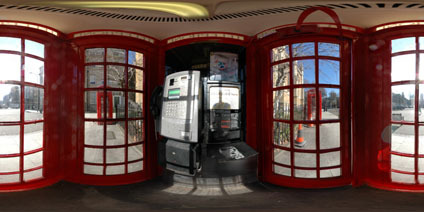 Your interior of the phone box has to be one of my favourite panoramas anywhere! Also, it’s on my way to work, so I see it everyday from my bike.